Home-grown Geneva talent, a shining example of the finest creativity and craftsmanship Geneva has to offer, Nadia Morgenthaler launched her own collection of jewellery in 2013, after 25 years spent deeply immersed in the city’s fine jewellery industry. In 2009, Nadia, a highly-trained and experienced goldsmith, took over the High Jewellery atelier where she had worked for many years, honing her skills, hand-crafting masterpieces for the world’s most famous Maisons. Her unmistakable style, displayed in all its glory at Gemgenève, is dramatically different, modern yet soft and romantic, rich yet delicate, architectural yet supremely feminine and fluid, and deeply yet subtly evocative of antique, aristocratic grandeur and splendour, of Belle Epoque elegance or the Maharajahs’ magnificence. Most of all, Nadia Morgenthaler jewels are characterised by a ravishing refinement: the finesse of details, such as the perlé or millegrain settings she favours, the darkened silver or gold, the hand-made chain, the gemstones of muted, often indefinable colours, powder pink or mint green tourmalines, spinels, indicolite, the contrast of scintillating light, of rock crystal and antique diamonds with the lustre of antique natural pearls that feature in virtually every jewel she creates. Nadia’s imaginative ideas are made possible only by her awe-inspiring technique, by her unique blend of artistry and engineering. She is uncompromising in her devotion to technical perfection. Every component of every jewel, material, colour, sheen, texture, technique, every detail is totally, seamlessly integrated into her design concept, each element plays a pivotal role in the design, structure or silhouette. Which gives her jewels their defining understated yet theatrical eloquence, divine proportions and subtle, secretive sensuality. Nadia tells how she relishes the challenge of creating 3-D structures, of highly complex construction, finding ingenious ways in which to suspend or integrate gemstones and pearls, especially for the earrings which have become her speciality. 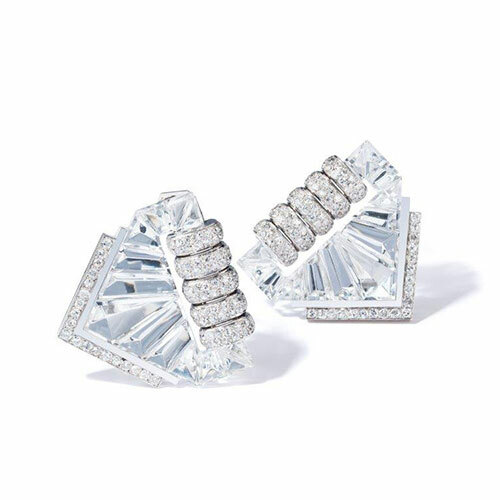 “Earrings bring light to the face, and can be seen from all sides. So my earrings have to be flexible, mobile and shimmering.” At Gemgenève, Nadia Morgenthaler will be showing her latest creations, many featuring rock crystal, her material of the moment, cut especially to her designs, to conjure images of 18th century candlelit chandeliers, a captivating complement to her distinctive, reduced palette of gem colours, her layering of light and lustre. She says, “I love the way in which rock crystal plays and interacts with light and movement.” It is the perfect material, with a long and noble history, and spiritual heritage, to infuse Nadia Morgenthaler’s exquisitely refined jewels with yet more light, charm and soul. Prized since late antiquity, especially in Eastern civilisations, rock crystal, a colourless quartz, was treasured as the ultimate luxury possession during the Medieval and Renaissance periods. Imbued with spiritual and amuletic powers on account of its clarity, considered a symbol of purity and truth, rock crystal was carved by virtuoso lapidaries into extravagant objects, vessels, jugs, goblets, and often set into gold and encrusted with gems. Such lavish objects took pride of place in royal collections, treasuries and princely Wunderkammer or Cabinets de Curiosites. Much later, rock crystal found a revered place in modernist jewellery and objects of the 1920s and 30s, when its clarity and colourlessness, its soft crystalline brilliance, its timeless modernity, perfectly suited the monochrome compositions of the Art Deco period. 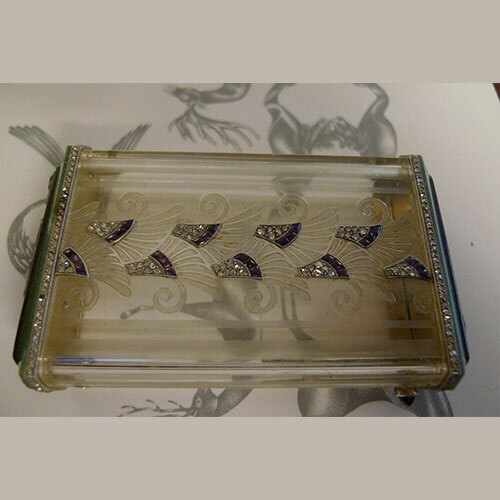 It could be carved or faceted, cut and polished to a gleaming, glasslike transparency or textured with a misty, frosted surface. 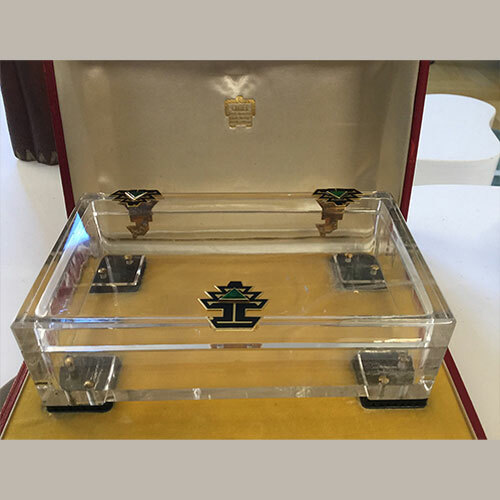 The sense of luxury that had long been associated with the material, its suitability for the art of the lapidary, was revived especially for personal accessories, boxes, vanity cases, and most memorably for Cartier’s mesmerising Mystery clocks. See the versatility and vibrancy of rock crystal, in varied guises, at Gemgenève: Swiss vintage jewellery dealers, Larengregor, will be showing a striking Art Deco rock crystal and enamel box, by Cartier, and Symbol & Chase, London dealers in antique and 20th century jewellery, offer a stunning pair of 1930s diamond and faceted rock crystal dress clips, one of the most iconic designs by the inimitable Suzanne Belperron.